Gerrity’s Weekly Ad Specials valid April 21 – April 27, 2019. 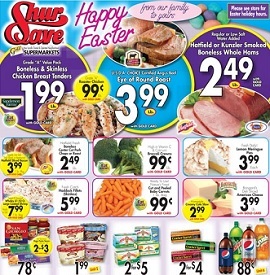 This Week Ad best deals, and grocery savings on: Hatfield, Kunzler Smoked Boneless Whole Hams; Hatfield Fresh Boneless Center Cut Pork Chops or Roast; Haddock Fillets; Turkey Hill Ice Cream; Land O’Lakes Butter Quarters; ShurSave Bottom Round Roast; Sweet Vidalia Onions; Fresh Green Peppers; Cooper C.V. Sharp Cheese; Lucky Leaf Cherry or Apple and Musselman’s Cherry Pie Filling; Pennsylvania Dutch Noodles; Newman’s Own Dressing; Breakstone’s Sour Cream; Gevalia or Maxwell House Coffee; Stroehmann Dutch Country Bread; Claussen Kosher Style Pickles; Margherita Prosciutto; Aunt Jemima Pancake Mix or Syrup; Paws Premium Dog Food; Louisiana Grown Yams; Fresh Asparagus; Del Monte Pineapples; California Strawberries; and much more. Find all deals, offers, and prices in the latest Gerrity’s Weekly Sale Ad Specials.